Tony Phillips, who enjoyed an 18-year career in the major leagues from 1982-1999 primarily with the Oakland Athletics, passed away Wednesday February 17, 2016 as the result of a heart attack according to Susan Slusser. He was 56. 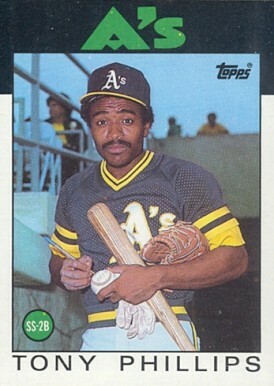 Very sad news: Dave Stewart tells me that Tony Phillips has died of an apparent heart attack at the age of 56. An extremely versatile fielder, Phillips saw action at every position on the field except pitcher and catcher during his major league career. He amassed 2,023 hits with a .266 average over his 18 seasons with the Athletics, Detroit Tigers, California Angels, Chicago White Sox, Toronto Blue Jays, and New York Mets. Phillips played professionally as recently as the 2015 season, when at the age of 56, he played in eight games with the independent Pittsburgh Diamonds.